Figure 6-14.Automotive type emergency/parking brake axle mounted. 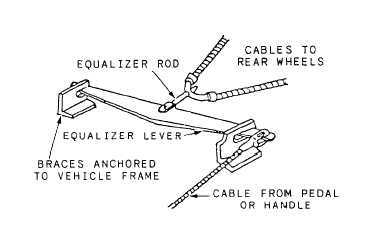 Home > Construction Training Manuals > Construction Mechanic Advanced > Figure 6-14.Automotive Type Emergency/Parking Brake Axle Mounted. Figure 6-14. - Automotive type emergency/parking brake axle mounted. are usually mounted on the output shaft of the transmission or transfer case directly in the drive line. Theoretically, this type of system is preferred for heavy equipment because the braking force is multiplied through the drive line by the final drive ratio and the braking action is equalized perfectly through the differential. Drawbacks are that severe strain is placed on the power transmission system, and also that the vehicle may move while it is being lifted since the differential is not locked out. Parking brakes interconnected with service brakes are usually found on automotive types of equipment (fig. 6-14). This type of emergency/parking brake is actuated by a foot pedal or a dash mounted handle assembly and is connected through linkage to an equalizer lever (fig. 6-15), rod assembly, and cables connected to the emergency/parking brake mechanism within the drums/discs (fig. 6-14) at the rear wheels. When you test parking brakes, stop the vehicle on a road graded at about 30 percent. Set the parking brake and release the service brakes. The vehicle should maintain its position and not roll or inch backwards. Repeat the test in the opposite direction. Again, the vehicle should hold its position. If there is no hill close by, you may test parking brakes by setting the brake, placing the vehicle in first gear (low), and slowly releasing the clutch with the engine idling (do not rev the engine while doing this exercise). This action should stall the engine of the vehicle you are testing. In the case of an automatic transmission, the vehicle should not move in any gear. In either of these tests, if the vehicle does move, it is an indication that there is a parking brake malfunction. Once you determine there is a problem, proceed as follows. First, inspect the condition of the emergency brake linings and contact surfaces just as you would for service brakes and just as carefully. Pay attention to the ratchet and paw] or any other automatic locking device that holds the brake in the applied position to make sure it is operating properly. In addition, when inspecting the drive line type brake, examine the universal joints and splines for loose bolts and grease leaks. Loose bolts are not uncommon for vehicles having brakes mounted in the drive line. Figure 6-15. - Equalizer linkage.